To the Aztecs, they were ayotochtl, or the turtle-rabbit. To pumas and jaguars, they were an elusive meal. And to the Spanish, they were the “little armored one.” When South and North America were united by the Isthmus of Panama 15 million years ago, armadillos began their long march northwards, becoming one of only four mammals to survive the trek. With the recent, drastic decline in natural predators, in the past 150 years they have proliferated across most of the continent. Today, the nine-banded armadillo—our resident North American species—can be found as far north as Oklahoma, Arkansas, and even Southern Indiana. Armadillos are covered from bald head to hairy toe with over two thousand bony scales, which are in turn covered with a thin layer of leathery skin. This armored “shell” was meant to protect them from predators’ claws and teeth. 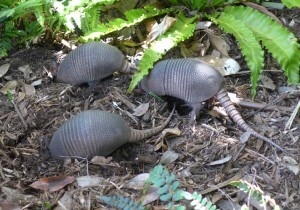 Beneath the armor, armadillos harbor pale, hairy bellies, stubby legs, and strong claws for digging up dinner. Though their tiny eyes and rough skin leave them with poor vision and sense of touch, their long, pinkish snouts are excellent for sniffing earth and sky to locate food and self-orient. The nine-banded armadillo spends most of the day sleeping, and most of the night rummaging with snout and claw in search of grub. What do armadillos eat? Anything from berries and fungus to eggs, beetles, termites, and earthworms is fair game—armadillos have been known to eat up to 40,000 ants in one sitting. They often become so engrossed—shuffling, grunting, and flicking food onto their tongues—that they will literally run into a nearby human before noticing they are not alone. Such a surprise can cause armadillos to jump up to four feet in the air, an unfortunate response when armadillos are beneath moving vehicles. Alternatively, they will try to escape by scuttling into nearby thorns and underbrush. Upon encountering water, armadillos either continue to mosey along the stream floor or swallow air, inflate like a pool toy, and float across. 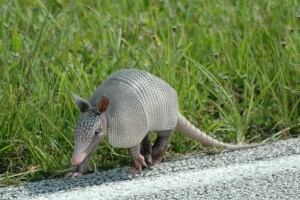 Armadillos eat lots of insects resulting in free pest control. Despite seeming rather oblivious at times, armadillos are nothing but meticulous when it comes to homemaking. They carefully select a location with loose soil, preferably in dense, shady wetlands or scrubby grasslands. Covered by brush, tall grasses, or rock piles, they build extensive networks of tunnels with multiple hidden entrances. Inside the burrows there are separate birthing chambers lined with leaves and grass, where identical quadruplets are born in the spring. Fan-tailed warblers can be found trailing behind a foraging armadillo, picking up any overlooked prey. Louisiana pine snakes have armadillos to thank for the fine habitat that their abandoned burrows provide. Armadillos also inadvertently help out hundreds of bacterial and protozoan parasites, as their dark, damp habitat makes them a prime host species. The only major North American predators for armadillos are humans, who hunt them for their meat and skin.